Wild Caught Tuna Crostini are a super healthy and colorful appetizer or light meal --- just add wine and friends and you've got the perfect summer party! . Heat a grill pan over medium high heat until very hot. Grill the slices of bread on both sides until nicely browned, about 3 minutes per side. Set aside. Prepare a simple tuna salad with the Yellowfin Tuna. Mix all the ingredients until well blended. Adjust seasonings to your taste. 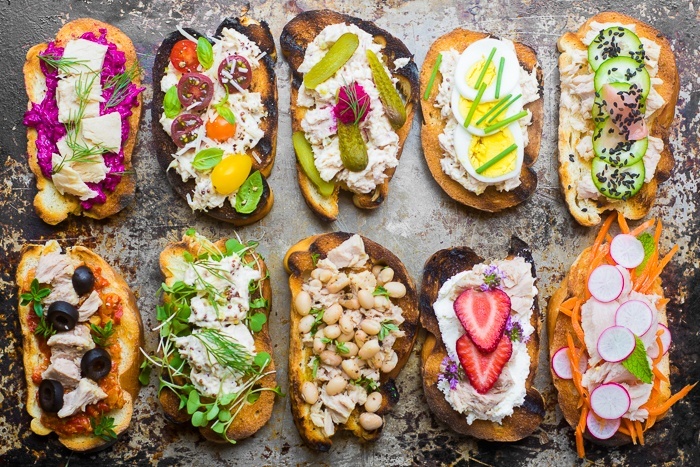 Assemble your crostini with three layers each. Begin with tuna salad, flaked tuna, or cream cheese or other spread. Build a second layer from the list above. If you didn't use your tuna on the first layer, you can add flaked tuna in this layer. Finish with a garnish of herbs, edible flowers, seeds, or spices from the list above. Serve the crostini right away.